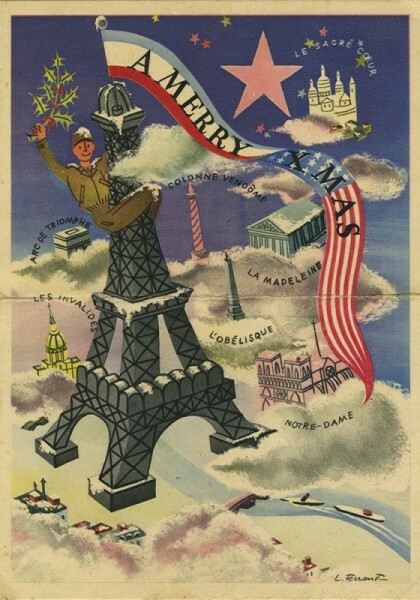 Images and text from two cards sent from France, November 1944. Illustrations appear to be by "L. Ferrand." I adore these cards. The illustrations are filled with playful whimsy and delightful design elements. For example, just look at how the thin stripes of flags are used both as roads and visual dividers. 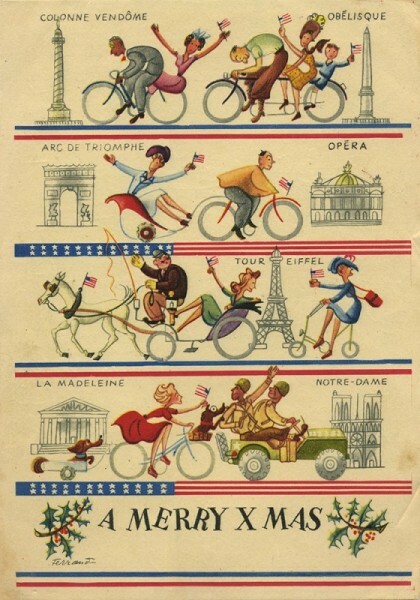 These cards were mailed months after Paris was liberated, and I love how the French are waving tiny American flags. You can just feel the exuberant joy in the illustration. My guess is that these cards were designed with American and British soldiers in mind; perhaps they were sold (or given) by the dozens to soldiers after the liberation. This is going via York because I have yet to receive your Bath address. Believe it or not, I have just begun to smoke that excellent tobacco you sent me at Sill last Xmas. I have the first pipeful going at this very moment. It takes a certain amount of peace of mind and free time to get the old brain into play. Already 8 men at a time from the (?) get 48 hour passes to Paris, so eventually I shall get there and hunt up a bottle of Chanel No.5 for you. Meanwhile, this uniquely French card carries my best wishes for a Merry Xmas & a Happy New Year. How are you to night. I am fine and in the fist of health. They give us some card so (?) sending you one. Hope you are fine and hope the little one is full of the (?) toy. I wish I be there when she was down there to the danced. Bet she was cute. I’ll be she thought she was pretty big. Honney I hope when Germany falls that we go back to the States and then go home. Well, I say by now and sweet dreams.